When we approve your teeth impressions, you will receive a link to the website where you order your desired custom teeth device. Night Guards for Grinders start at ONLY $153. The Hard Acrylic Nightguard is for those people that have a teeth grinding problem. Teeth grinding is when your jaw moves back and forth which causes your teeth to rub together (grind). This teeth device separates the teeth and protects them by not allowing the grinding of the teeth but offers a flat, even surface made of hard acrylic. This device will also protect your teeth from clinching but our Dual Layer Nightguard is better suited for those that just clinch. 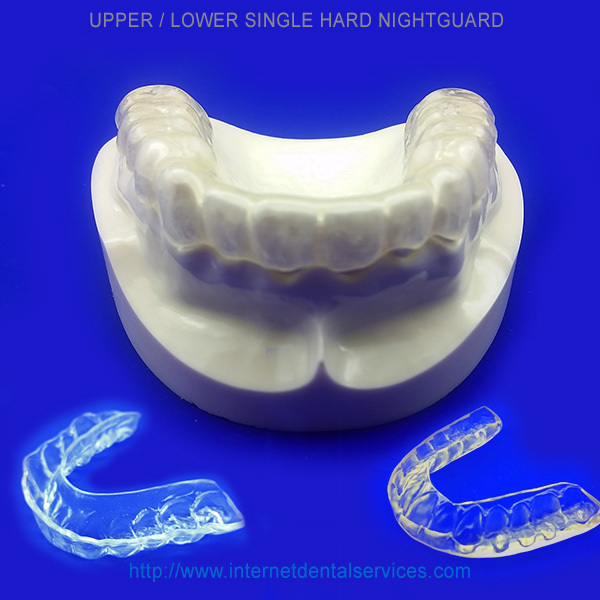 When you order our Hard Acrylic Nightguard you will receive our teeth impression kit within 2-3 days. After you create your impressions and send them back to us in our prepaid mailer, it takes 10-12 days to manufacture your product (the same time as if you had gone to a dentist). These are the same high quality products that are made by laboratories that dentist use, for close to half the cost. To clean the Hard Acrylic Nightguard simply brush it with toothpaste and water after each use. You can use effervescent tablets as needed for deep cleaning.